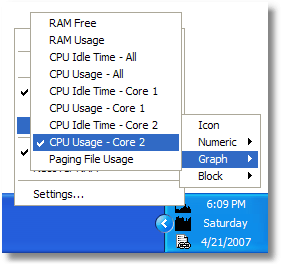 Cacheman displays upto five (you can disable any of them) icons in the Windows Tray Area. ... and as numeric values. Single clicking any of the Icons can set the display to alternate mode. This way you can configure every Tray Icon twice, and switch the display quickly. To enable alternate mode switching (disabled by default) turn on the alternate checkbox on the options tab of the main window. 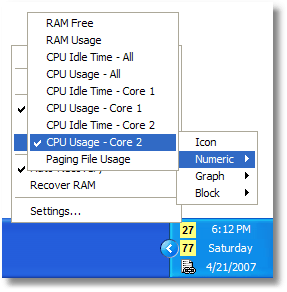 You can also configure the tray icon display and set a Hotkey to show the Cacheman control window on the Options tab.